Offering you a complete choice of products which include all in one solar street light. STREET LIGHTS is the technology of obtaining usable energy from the light of the sun using semi conductor materials an this is energy efficient lighting technology. Lokozo lights are a range of high-quality luminaries designed to reduce lighting costs without compromise to the visual quality of outdoor environments. §High efficiency; §High lumens output & uniformity; §Low power consumption; §Low maintenance costs; §Automatic ON/OFF control system §Automatic dimming control system. §The aluminium material is of heat, corrosion and UV resistant type. Production Capacity: 1000 Nos per day. 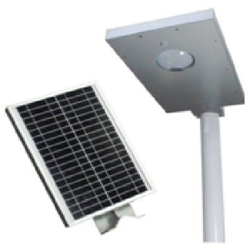 Looking for Solar Integrated street light ?